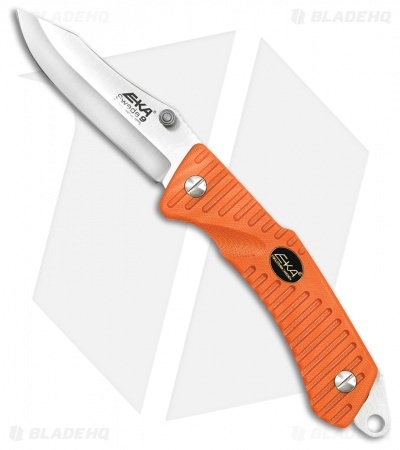 The EKA Swede 9 is a manual folding knife that is sturdy with a unique rear locking bar that creates a positive blade lock and a comfortable grip. This is assembled with procession machine screws, which allows the user to fine-tune blade action and fully disassemble for a complete cleaning. This includes a nylon braided lanyard and Mini-Fire Sharp, which is a combined tool to sharpen your knife and start fires. Swedish Sandvik 12C27 stainless steel, clip point blade with a satin finish. Lanyard hole and pocket clip included.